Huawei Y3 becomes the lucky handset to hit the UK’s market as the most affordable smartphone in the country. Huawei has no idea about the second milestone of its entry-level handset, so let’s focus all in the first accomplishment. With such a low price tag, Huawei’s product is less expensive than the extra low-priced Android Go phones. Huawei Y3 is listed at the Carphone Warehouse online store to sell in the UK as the country’s cheapest smartphone. Its pricing is only £59, unlocked and SIM-free, but you also have the chance to put hands on it without any upfront costing just by signing up at the £5 per month plan from iD. iD is the Carphone Warehouse’s own Mobile Virtual Network Operator (MVNO). The basic £55 iD plan offers you the Huawei Y3 for free, 150 UK minutes, 5000 text messages, and 250MB of 3G data each month, this plan is a two-year contract and will be offered for 24 months. If that’s not enough, add and £2.50 in extras and get 250 minutes, 5000 texts, and 500MB of 3G data each month. If these do not satisfy you, then the £12.50 plan with 500 minutes, 5000 texts and 1GB of 3G data will surely do. What Huawei Y3 packs to worth £59? There’s no need to cite that the Huawei Y3 is an entry-level handset. It sports a 4-inch WVGA display (480 x 800p), runs on the Spreadtrum 7731CPU processor with quad-core CPU clocked at 1.2GHz, sports a 5 MP rear camera and a 2 MP front camera. 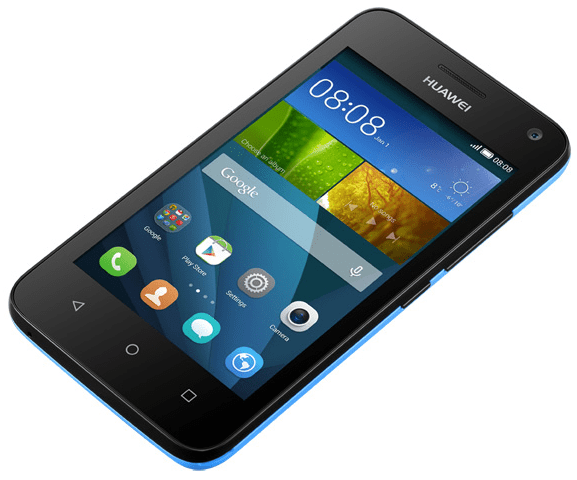 It has 512MB of RAM, 4GB of internal storage and runs Android 4.4 KitKat topped by Huawei Emotion UI 3.0 Lite. Its connectivity supports include 3G network, GPS, and G-sensor. Gets powered by a 1,750 mAh battery, weighs 120 grams and will sell in White and Black colors.